National Education Association. An Educator's Guide to the Four Cs: Preparing 21st Century Students for a Global Society. http://www.nea.org/tools/52217.htm Retrieved Februaru 13, 2014. Pink, Daniel. (2009). Drive: The Surprising Truth about What Motivates Us. Riverhead Books: New York. As part of a seminar on ebooks I collaborated with my son using Puppet Pals to retell Patrick O'Donnell's "A Gift of Nothing" (see previous post). This was an experiment - I'd never used Puppet Pals in this way before and found the process to be a rich learning experience for both of us. I had first thought of re-telling The Three Little Pigs or another familiar fairy tale but as we discussed which storyline we'd follow, my wise 8 year went to the bookshelf and pulled out this favourite: "A Gift of Nothing". We read it again together and decided that this would be the book we would retell. We changed the characters from cat to mouse and dog to duck. We selected puppets from the Puppet Pals character cast to play the characters in O'Donnell's story. We chose background scenery to represent the various locations in the book. We needed to do some creative problem-solving when there wasn't a shopping mall to choose: our solution was a castle and it worked perfectly, adding an element of humour to the story. We decided on the roles we would each play and delegated tasks. After spending some time practising and becoming familiar with the program itself we were ready to record. One of the features I appreciate about Puppet Pals is that you can pause the recording at any time to gather your thinking. I feel pressure and stress when I'm recording my own voice so this works really well for learners who need to stop and re-set. The recording ended up being just over 4 minutes which I find is a perfect length for a project to feel satisfying without being overwhelming. I published it to YouTube and enjoyed re-watching it a few times with my son and again when a friend stopped by for a visit. At first I was pleased to have spent some quality time with my son working on a creative project. When he came to me the next day wanting to do another story using Puppet Pals I started to wonder about deeper learning processes that were occurring through this seemingly simple project. I returned to an article I had read this week on TeachThought: 10 Strategies to Reach the 21st Century Reader. I wondered how this little Puppet Pals project might connect 21st century learners to reading. I went through the strategies one at a time to see how my project matched the author's suggestions. My Puppet Pals project does this because it uses a classic media form to inspire the modern media project. It also encourages learners to make a personal connection to classic media and then use that connection to engage in the project. 7. Have students use RAFT-Role, Audience, Format, and Topic/Tone/Theme. Then have them revise media in response to new roles, audiences, formats, or topics, tones, or themes. Martin Luther King’s “I Have A Dream Speech” in a new format (a video? ), or to a new audience (modern hip-hop artists? ), or with a new tone (angry?). Students experimenting here are experimenting with media design! I'm wondering how this could be done...perhaps on a blog or accompanying Google Doc? This close analysis of our Puppet Pals project using these 10 strategies as criteria really helped to bring coherence to the project as well as to my understanding of 21st century learning processes. My K-2 students each have access to iPads for the next week and I will definitely be doing this project with them and our big buddies. Mooch & Earl: A Retelling of Patrick O'Donnell's "A Gift of Nothing"
My 8 year old son and I experimented with Puppet Pals (iPad app) to retell one of our favourite stories. Blended learning is so much more than simply using technology as a teaching and learning tool. This, however, is a place to start, which is where I started my relationship with technology in education. As a student teacher I planned and delivered many of my lessons using PowerPoint and tried my best to use video and audio to enrich my lessons in order to attend to multiple learning needs. As a teacher-on-call I brought my own projector to share some of my lessons and to access my favourite videos to use spontaneously or as motivation for my students to finish what the teacher had prepared for them to complete while away. This strategy worked marvelously! I was excited when I received my first teaching assignment and there was a projector and a document reader in my classroom. I was able to bring my own laptop and iPad to share content and inspire students. In some ways I felt like I was successful in engaging my students however one thing bothered me: how was this different from me being the sage on the stage? Students were engaged with the content I was presenting to them in a variety of ways but they weren't actively interactively with the content nor were they using technology to demonstrate their own learning or to produce anything meaningful. I was able to identify this problem but I didn't know what to do about it. A few months later I received Mary O'Neill's invitation to OLTD and I've been working on how to actively involve my students using technology in a blending learning situation ever since! My next teaching contract was in a Kindergarten French Immersion class. The school itself was relatively low-tech but I was determined to do my best to "blend" my teaching practice. I mainly delivered content for the first part of the year but then started to get creative when I partnered with a big buddy class whose teacher was also interested in technology as a way to support learning. We combined out limited computer lab time and created projects for the students using online learning tools like Storybird.com and other tools to demonstrate learning. I shared student work on our class blog and my 5 year old students became published writers and artists. The motivation was incredible! My kindergarten contract was coming to an end when I was offered a position with Navigate's Fine Arts eCademy (FAE). I was excited for the opportunity to teach in a blended learning environment. I came to realize that blended for FAE meant three days F2F at school and two days at home where parents were in charge of facilitating numeracy and literacy learning. My job is to support this home learning by providing resources and support for parents online and through print-based resources. As I started planning my Kindergarten - Grade 2 program I was excited to blend my program by using a variety of online tools for learning both at home and at school. One of my tasks is to personalize learning programs for each student which has become a creative challenge. I've learned that while some families fully embrace all my suggestions and recommendations, others want none of it! There are families who pick and chose what works for the child and family. I'm learning to accept that "blended learning" looks different child-to-child and family-to-family. It has become a creative challenge to figure out what works for each family - practically and philosophically - and tailor a learning program to suit the learner's needs. When students are F2F for our three days together I also try to integrate technology to support and personalise learning but still find I do more content delivery using technology than student-driven projects which demonstrate their personalised learning journey. It is easy for my to find engaging content and even apps which develop creative and critical problem-solving skills. My challenge with blending learning at the early primary level is to teach and practice the skills so these 5 - 7 year olds can be natural producers using technology instead of passive consumers of content. When I first heard the words "3D printing" I could not wrap my head around what this would look like and how it might be useful to my teaching and learning practice. In my mind I imagined a giant 2D printer robot that used paper to construct a 3D origami-like structure. Remembering that my imagination is my only limit, I dived into this new world as a 3D printing seminar leader only to discover it had been evolving since the 1980s. Time to catch up! I am fortunate to be involved with a school that recently purchased a 3D printer for a program that teaches technology, robotics and engineering. It made complete sense to me when I finally saw the machine and watched it print out a plastic, orange nut and a bolt. I was mesmerized and proudly showed the creation to all my friends. The Grade 6-9 students who witnessed my fascination were entertained - for them, 3D printing technology is as commonplace as a toaster. I delved into the research and experience of 3D printer-users and found some remarkable products made by 3D printers ranging from the useful to life-saving to time-wasting. What was most amazing to me as an educator, however, was not the product but the process. 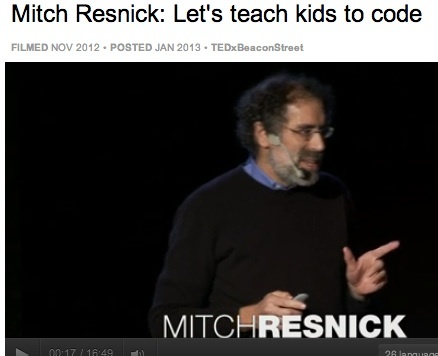 In my previous blog post I commented on the learning value Mitch Resnick found in coding. These are also found in the 3D printing process: concept development, design process, systematic reasoning, collaboration and critical and creative thinking. I also noticed how 3D printing inspired innovation in sectors not obviously connected to the industry: plastic recycling and international development. PlasticBank.org aims to "remove plastic waste while helping people ascend from poverty and transition into entrepreneurship". 3D printing could increase the value of plastic making it something people throw out less and recycle more. This is one example of how 3D printing has inspired people to find sustainable, innovative solutions to current problems using an emerging technology. There are also people out there right now finding ways to print human cells for manufacturing organs. NASA is even printing pizza for space exploration. I would love to have access to a 3D printer to create manipulatives for my students as learning tools. If I were teaching older students I would create design challenges and print designs that show evidence of the learning processes Resnick mentioned in his TEDTalk on coding. Now that I've entered the world of 3D printing and my the image of the origami structure has (thankfully) been replaced, I'm looking forward to participating more actively in the industry and finding ways to incorporate the 3D printing process into my teaching and learning process. And by the way, if you were curious about the fate of my beloved orange nut and bolt...it has found a special place in my classroom as the most favourite fidget (calming) tool in our collection. Who knew! As I wade somewhat dizzily through the new worlds emerging technologies are opening up I'm kindly reminding myself of J.R. Tolkien's wise words: "Not all that glitters is gold; not all who wander are lost". I've been having a difficult time writing this blog post. I like my writing to be thoughtful, considered and well-crafted. However, the pace at which my brain is trying to wrap itself around emerging technologies is not conducive to these qualities. Staying awake too late reading/listening to mind-blowing articles/videos/TEDTalks - yes. Sitting down to synthesize what I'm learning in a meaningful, thoughtful and well-crafted way - no. Learning about emerging technologies has brought some "disequilibrium" to my learning process which, while valuable, also feels uncomfortable. Listening to this TEDTalk by Mitch Resnick helped me to realize that part of my discomfort came from my lack of fluency with the technologies I've been exploring. Fluency, according to Resnick, means that you can both interact with the technology and use it as a means of expression. Fluency means that you can create using the technology and understand the complex layers or building blocks that make the technology what it is. Resnick uses coding as an example of achieving 'internet fluency'. He argues that coding not only helps to understand the internet and its tools, it also brings together virtual and physical worlds. My sense of unbalance with respect to emerging technologies is this: my brain is in the virtual, theoretical world and I haven't figured out how bring these ideas to the physical world of teaching and learning. I appreciate how Resnick identifies the learning processes going on when people develop coding fluency. They deeply understand concepts, experience the process of design, learn to reason systematically, think critically and creatively and work collaboratively. Underlying all this is engagement. These processes will help bridge the virtual and physical worlds when integrating any kind of technology into my teaching and learning. Mitch Resnick first caught my attention with his Lifelong Kindergarten group whose ultimate goal is "a world full of playfully creative people who are constantly inventing new opportunities for themselves and their communities". While I teach kindergarten and value this goal for all learners, I'd like extend this practice to my own learning as I play with emerging technologies. My goal is to develop my fluency with integrating technology to support learning and to keep abreast with new tech as it emerges. I will need to think clearly about my criteria that will inform my decision on which technologies to embrace (or not). 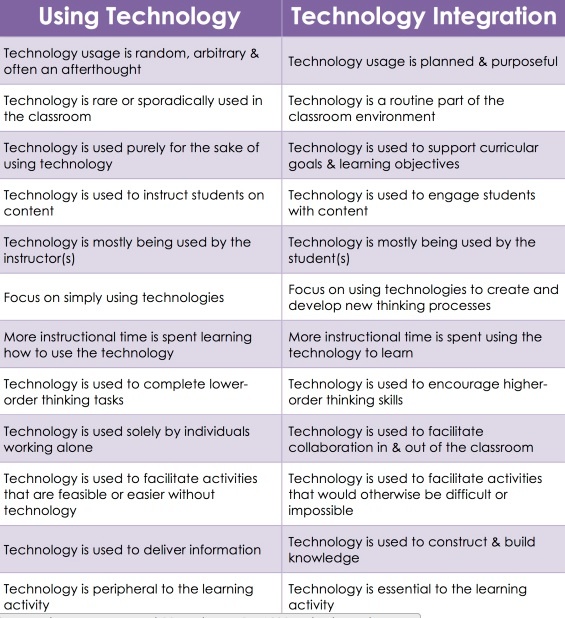 The chart below provides a valuable guideline with which to frame the questions I will need to ask to ensure my technology integration is appropriate, engaging and meaningful. Tell a story about an emerging technology or initiative. This can be a story about an initiative you were part of implementing or one in which you were an "implementee". What were the major barriers to success? If it was successful, what one thing can you point to that it would not have been a success without? In 2008, I did a practicum at a large high school where I taught English Literature and Humanities. I had been learning about UDL and multiple intelligences and wanted to plan my teaching units with these principles in mind. My lessons were to be presented using text, visuals, audio and video. It was a convoluted process transferring the YouTube videos onto my computer so I could access them without access to the internet but I felt it was worth it. My practicum teacher didn't bother with technology. In a way, his reasoning made sense: there were three projectors accessible for teachers at this school of 1000+ students. You had to book the device weeks in advance and invariably spend your lunch hour tracking it down. There was no internet connection and even if there were, most sites like YouTube were blocked. While I could see his reluctance to adopt any form of technology as a teaching and learning tool, I was of a different mind: I felt it my duty to engage my diverse learners (many of whom kept school-banned phones in their shoes) using multiple modalities. Also, as a student teacher I (selfishly) knew that my best classroom management strategy would be to engage and even surprise my learners with media they could relate to and appreciate. I wanted to spark their curiosity by using tools that were part of their lives. The lessons I designed followed a pattern that went something like this: a multimedia hook, questions for discussion, extensions and connections and finally a project-based assignment. I planned all my lessons for the 8 week practicum only to realize there was no way I could have enough access to the projector to share my lessons. What was I going to do??? Flexibility is key in teaching but without my videos and presentation I had nothing! In desperation, I went onto eBay and with the last of my student loan, bought myself a refurbished mini projector. Turns out, it was the best purchase of my early teaching career as not only did it help me teach successful units for my practicum, it became my best friend when I started TOCing. 5 years later, every classroom I know of has its own projector and, in many cases, access to the internet. YouTube is no longer banned. This experience teaches me that determination and perseverance are key when implementing technology into a teaching and learning practice on any scale. "This too shall pass" comes to mind as a mantra. While my first 21st century experience at schools included No Device rules, now even my son's elementary school has a healthy BYOD policy. While in the moment, restrictive policies and lack of technology can be limiting, things are actually changing more rapidly than it may feel. I think that change happens when, as Margaret Mead described, "a small and thoughtful group of committed citizens" perseveres knowing that what they are doing is worthwhile. The willingness to take a risk helps as well as open-mindedness and creative problem-solving. Then, let go and change what is not working.